This cool vintage Fukuda postcard1 features a fanciful illustrated map of the Tokyo area, with the Imperial Palace at the center. I'm not sure if the road system was actually built this way or if it's just a creative interpretation by this illustrator, but it's interesting to see an approximation of taijitu — the symbol for the concept of yin and yang — woven into the design. I didn't find a good answer to that question, but I did stumble upon this neat 2010 post on Travora about great metro maps of the world while doing some research. "A publisher of books and postcards. 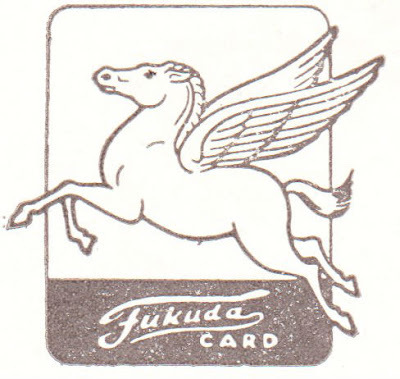 Their cards, produced in offset lithography and as Fuku Color photochromes were made in Japan. They did work for the Japanese Travel Bureau and their cards were designed for a duel audience with titles printed in both English and Japanese." The pegasus-themed company logo shown at right is from the back of today's postcard. Excellent map. 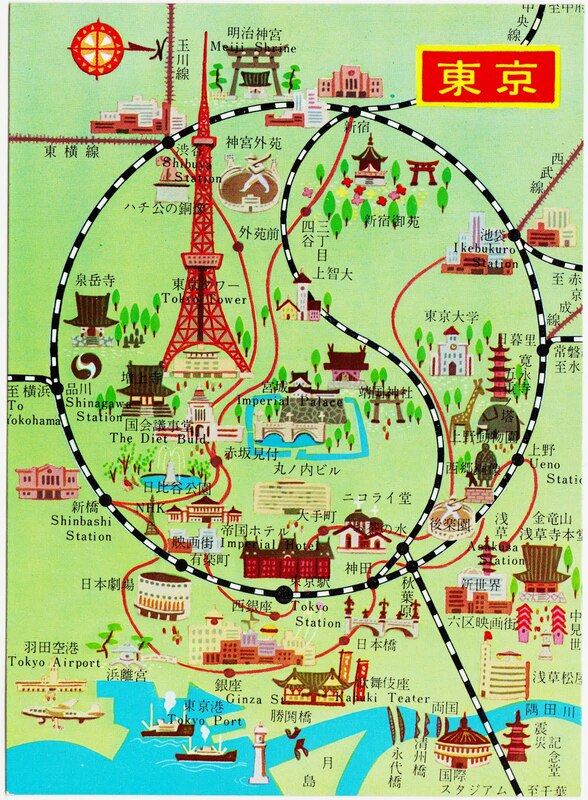 This would still be fairly useful today, as many of the featured locations are still major sites in Tokyo, e.g. Tokyo Station, Shibuya, Asakusa, etc.